A laser (an acronym for Light Amplification by Stimulated Emission of Radiation) is an electronic-optical device that emits coherent radiation. As a light source, a laser can have various properties, depending on the purpose for which it is designed. A typical laser emits light in a narrow, low-divergence beam and with a well-defined wavelength (corresponding to a particular color if the laser operates in the visible spectrum). By contrast, a light source such as an incandescent light bulb emits into a large solid angle and over a wide spectrum of wavelengths. These properties can be summarized by the term coherence. The first working laser was demonstrated in May 1960 by Theodore Maiman at Hughes Research Laboratories. Recently, lasers have become a multi-billion dollar industry. Their most widespread use is in optical storage devices such as compact disc and DVD players, in which the laser scans the surface of the disc. Other common applications of lasers are bar code readers and laser pointers. In industry, lasers are used for cutting steel and other metals and for inscribing patterns (such as the letters on computer keyboards). Lasers are also commonly used in various fields in science, especially spectroscopy, typically because of their well-defined wavelength or short pulse duration in the case of pulsed lasers. Lasers are also used for military and medical applications. 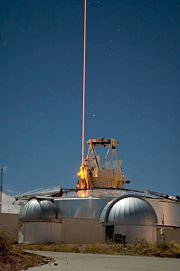 Experiment with a laser (US Military). A laser consists of a "gain medium" inside an optical cavity, with a means to supply energy to the gain medium. The gain medium is a material (gas, liquid, solid, or free electrons) with appropriate optical properties. In its simplest form, the cavity consists of two mirrors arranged such that light bounces back and forth, each time passing through the gain medium. Typically, one of the two mirrors, the "output coupler," is partially transparent. The output laser beam is emitted through this mirror. Light of a specific wavelength that passes through the gain medium is amplified; the surrounding mirrors ensure that most of the light makes many passes through the gain medium. Part of the light that is between the mirrors (i.e., is in the cavity) passes through the partially transparent mirror and appears as a beam of light. The process of supplying the energy required for the amplification is called "pumping," and the energy is typically supplied as an electrical current or as light at a different wavelength. In the latter case, the light source can be a flash lamp or another laser. Most practical lasers contain additional elements that affect properties such as the wavelength of the emitted light and the shape of the beam. In terms of the principles of physics, scientists consider the laser as a combined quantum-mechanical and thermodynamical process. In 1950, Alfred Kastler(Nobel Prize winner for Physics 1966 ) proposed the method of optical pumping, which was experimentally confirmed by Brossel, Kastler and Winter two years later. In 1953, Charles H. Townes and graduate students James P. Gordon and Herbert J. Zeiger produced the first microwave amplifier, a device operating on similar principles to the laser, but amplifying microwave rather than infrared or visible radiation. Townes's maser was incapable of continuous output. Nikolay Basov and Aleksandr Prokhorov of the Soviet Union worked independently on the quantum oscillator and solved the problem of continuous output systems by using more than two energy levels and produced the first maser. These systems could release stimulated emission without falling to the ground state, thus maintaining a population inversion. In 1955 Prokhorov and Basov suggested an optical pumping of multilevel system as a method for obtaining the population inversion(a population inversion occurs when a system (such as a group of atoms) exists in state with more members in an excited state than in lower energy states), which later becomes one of the main methods of laser pumping. Townes, Basov, and Prokhorov shared the Nobel Prize in Physics in 1964 "For fundamental work in the field of quantum electronics, which has led to the construction of oscillators and amplifiers based on the maser-laser principle." In 1957, Charles Hard Townes and Arthur Leonard Schawlow, then at Bell Labs, began a serious study of the infrared maser. As ideas were developed, infrared frequencies were abandoned with focus on visible light instead. The concept was originally known as an "optical maser." Bell Labs filed a patent application for their proposed optical maser a year later. Schawlow and Townes sent a manuscript of their theoretical calculations to Physical Review, which published their paper that year (Volume 112, Issue 6). The term "laser" was first introduced to the public in Gould's 1959 conference paper "The LASER, Light Amplification by Stimulated Emission of Radiation" </ref> Gould intended "-aser" to be a suffix, to be used with an appropriate prefix for the spectra of light emitted by the device (x-ray laser = xaser, ultraviolet laser = uvaser, etc.). None of the other terms became popular, although "raser" was used for a short time to describe radio-frequency emitting devices. The first working laser was made by Theodore H. Maiman in 1960 at Hughes Research Laboratories in Malibu, California, beating several research teams including those of Townes at Columbia University, Arthur L. Schawlow at Bell Labs, and Gould at a company called TRG (Technical Research Group). Maiman used a solid-state flashlamp-pumped synthetic ruby crystal to produce red laser light at 694 nanometers wavelength. Maiman's laser, however, was only capable of pulsed operation due to its three energy level pumping scheme. Later in 1960 the Iranian physicist Ali Javan, working with William Bennet and Donald Herriot, made the first gas laser using helium and neon. Javan later received the Albert Einstein Award in 1993. When lasers were invented in 1960, they were called "a solution looking for a problem." Since then, they have become ubiquitous, finding utility in thousands of highly varied applications in every section of modern society, including consumer electronics, information technology, science, medicine, industry, law enforcement, entertainment, and the military. Some of the other applications include medical (Bleed less Surgery, Laser healing, Survical treatment, Kidney stone treatment, Eye treatment, dentistry), Industrial (Cutting, Welding, Material heat treatment), Defense (Battle field, Anti-missile, Directed Energy Weapon (DEW), Electro Optic Counter Measures (EOCM)), Research tool (Spectroscopy, Laser ablation, Laser annealing, Laser scattering, Laser interferometers, LIDAR), Product development / Commercial (Laser Printers, Compact disc, Barcode scanners, Laser pointers, Holograms). A laser is composed of an active laser medium, or gain medium, and a resonant optical cavity. The gain medium transfers external energy into the laser beam. It is a material of controlled purity, size, concentration, and shape, which amplifies the beam by the quantum mechanical process of stimulated emission, predicted by Albert Einstein while he studied the photoelectric effect. The gain medium is energized, or pumped, by an external energy source. Examples of pump sources include electricity and light, for example from a flash lamp or from another laser. The pump energy is absorbed by the laser medium, placing some of its particles into high-energy ("excited") quantum states. Particles can interact with light both by absorbing photons or by emitting photons. Emission can be spontaneous or stimulated. In the latter case, the photon is emitted in the same direction as the light that is passing by. When the number of particles in one excited state exceeds the number of particles in some lower-energy state, population inversion is achieved and the amount of spontaneous emission due to light that passes through is larger than the amount of absorption. Hence, the light is amplified. Strictly speaking, these are the essential ingredients of a laser. However, usually the term laser is used for devices where the light that is amplified is produced as spontaneous emission from the same gain medium as where the amplification takes place. Devices where light from an external source is amplified are normally called optical amplifiers. Lasing without maintaining the medium excited into a population inversion, was discovered in 1992 in sodium gas and again in 1995 in rubidium gas by various international teams. This was accomplished by using an external maser to induce "optical transparency" in the medium by introducing and destructively interfering the ground electron transitions between two paths, so that the likelihood for the ground electrons to absorb any energy has been canceled. Many different types of lasers have been generated and are useful for a wide variety of applications. Some of them are presented below. 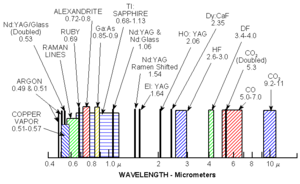 Spectral output of several types of lasers. Gas lasers using many gases have been built and used for many purposes. They are one of the oldest types of laser. The helium-neon laser (HeNe) emits at a variety of wavelengths and units operating at 633 nm are very common in education because of its low cost. Carbon dioxide lasers can emit hundreds of kilowatts at 9.6 µm and 10.6 µm, and are often used in industry for cutting and welding. The efficiency of a CO2 laser is over 10 percent. Argon-ion lasers emit 458 nm, 488 nm or 514.5 nm. Carbon monoxide lasers must be cooled but can produce up to 500 kW. Chemical lasers are powered by a chemical reaction, and can achieve high powers in continuous operation. For example, in the Hydrogen fluoride laser (2700-2900 nm) and the Deuterium fluoride laser (3800 nm) the reaction is the combination of hydrogen or deuterium gas with combustion products of ethylene in nitrogen trifluoride. Excimer lasers are powered by a chemical reaction involving an excited dimer, or excimer, which is a short-lived dimeric or heterodimeric molecule formed from two species (atoms), at least one of which is in an excited electronic state. They typically produce ultraviolet light, and are used in semiconductor photolithography and in LASIK eye surgery. Commonly used excimer molecules include F2 (fluorine, emitting at 157 nm), and noble gas compounds (ArF (193 nm), KrCl (222 nm), KrF (248 nm), XeCl (308 nm), and XeF (351 nm)). Solid state laser materials are commonly made by doping a crystalline solid host with ions that provide the required energy states. For example, the first working laser was a ruby laser, made from ruby (chromium-doped sapphire). Neodymium is a common dopant in various solid state laser crystals, including yttrium orthovanadate (Nd:YVO4), yttrium lithium fluoride (Nd:YLF) and yttrium aluminium garnet (Nd:YAG). All these lasers can produce high powers in the infrared spectrum at 1064nm. They are used for cutting, welding and marking of metals and other materials, and also in spectroscopy and for pumping dye lasers. These lasers are also commonly frequency doubled, tripled or quadrupled to produce 532nm (green, visible), 355nm (UV) and 266nm (UV) light when those wavelengths are needed. Solid state lasers also include glass or optical fiber hosted lasers, for example, with erbium or ytterbium ions as the active species. These allow extremely long gain regions and can support very high output powers because the fiber's high surface area to volume ratio allows efficient cooling. In addition, the fiber's wave-guiding properties tend to reduce thermal distortion of the beam. Quite often, the fiber is designed as a double-clad glass fiber. This type of fiber consists of a fiber core, an inner cladding and an outer cladding. The index of the three concentric layers is chosen so that the fiber core acts as a single-mode fiber for the laser emission while the outer cladding acts as a highly multimode core for the pump laser. This lets the pump propagate a large amount of power into and through the active inner core region, while still having a high numerical aperture (NA) to have easy launching conditions. Fiber lasers have a fundamental limit in that the intensity of the light in the fiber cannot be so high that optical nonlinearities induced by the local electric field strength can become dominant and prevent laser operation and/or lead to the material destruction of the fiber. Commercial laser diodes emit at wavelengths from 375 nm to 1800 nm, and wavelengths of over 3 µm have been demonstrated. Low power laser diodes are used in , laser printers, and CD/DVD players. More powerful laser diodes are frequently used to optically pump other lasers with high efficiency. The highest power industrial laser diodes, with power up to 10 kW, are used in industry for cutting and welding. External-cavity semiconductor lasers have a semiconductor active medium in a larger cavity. These devices can generate high power outputs with good beam quality, wavelength-tunable narrow-linewidth radiation, or ultrashort laser pulses. Dye lasers use an organic dye as the gain medium. The wide gain spectrum of available dyes allows these lasers to be highly tunable, or to produce very short-duration pulses (on the order of a few femtoseconds). The modelocked laser is a most versatile tool for researching processes happening at extremely fast time scales (femtosecond physics and femtosecond chemistry, also called ultrafast science), for maximizing the effect of nonlinearity in optical materials (e.g., in second-harmonic generation, parametric down-conversion, optical parametric oscillators and the like), and in ablation applications. Again, because of the short timescales involved, these lasers can achieve extremely high peak powers. Another method of achieving pulsed laser operation is to pump the laser material with a source that is itself pulsed, either through electronic charging in the case of flashlamps, or another laser which is already pulsed. Pulsed pumping was historically used with dye lasers where the inverted population lifetime of a dye molecule was so short that a high energy, fast pump was needed. The way to overcome this problem was to charge up large capacitors which are then switched to discharge through flashlamps, producing a broad spectrum pump flash. Pulsed pumping is also required for lasers which disrupt the gain medium so much during the laser process that lasing has to cease for a short period. These lasers, such as the excimer laser and the copper vapour laser, can never be operated in continuous wave mode. Even the first laser was recognized as being potentially dangerous. Theodore Maiman characterized the first laser as one "Gillette"; as it could burn through one Gillette razor blade. Today, it is accepted that even low-power lasers with only a few milliwatts of output power can be hazardous to human eyesight. At wavelengths which the cornea and the lens can focus well, the coherence and low divergence of laser light means that it can be focused by the eye into an extremely small spot on the retina, resulting in localized burning and permanent damage in seconds or even less time. Lasers are classified into safety classes numbered I (inherently safe) to IV (even scattered light can cause eye and/or skin damage). Laser products available for consumers, such as CD players and laser pointers are usually in class I, II, or III. Certain infrared lasers with wavelengths beyond about 1.4 micrometres are often referred to as being "eye-safe." This is because the intrinsic molecular vibrations of water molecules very strongly absorb light in this part of the spectrum, and thus a laser beam at these wavelengths is attenuated so completely as it passes through the eye's cornea that no light remains to be focused by the lens onto the retina. The label "eye-safe" can be misleading, however, as it only applies to relatively low power continuous wave beams and any high power laser at these wavelengths can burn the cornea, causing severe eye damage. In analogy with optical lasers, a device which produces any particles or electromagnetic radiation in a coherent state is also called a "laser," usually with indication of type of particle as prefix (for example, atom laser.) In most cases, "laser" refers to a source of coherent light or other electromagnetic radiation. In air, however, moderate intensity (tens of mW/cm²) laser beams of shorter green and blue wavelengths and high intensity beams of longer orange and red wavelengths can be visible due to Rayleigh scattering. With even higher intensity pulsed beams, the air can be heated to the point where it becomes a plasma, which is also visible. This causes rapid heating and explosive expansion of the surrounding air, which makes a popping noise analogous to the thunder which accompanies lightning. This phenomenon can cause retro-reflection of the laser beam back into the laser source, possibly damaging its optics. When this phenomenon occurs in certain scientific experiments it is referred to as a "plasma mirror" or "plasma shutter." Some action movies depict security systems using lasers of visible light (and their foiling by the hero, typically using mirrors); the hero may see the path of the beam by sprinkling some dust in the air. 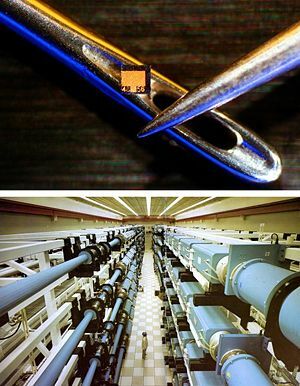 It is far easier and cheaper to build infrared laser diodes rather than visible light laser diodes, and such systems almost never use visible light lasers. Additionally, putting enough dust in the air to make the beam visible is likely to be enough to "break" the beam and trigger the alarm. Science fiction films special effects often depict laser beams propagating at only a few metres per second—slowly enough to see their progress, in a manner reminiscent of conventional tracer ammunition—whereas in reality a laser beam travels at the speed of light and would seem to appear instantly to the naked eye from start to end. Some fans claim that the "laser beams" shown in such movies are in fact other type of sci-fi weaponry, such as particle beams or plasma weapons. Several of these misconceptions can be found in the 1964 James Bond film Goldfinger, which was probably the first film to use a laser in its plot. In one of the most famous scenes in the Bond films, Bond, played by Sean Connery, faces a laser beam approaching his groin while melting the solid gold table to which he is strapped. The director Guy Hamilton found that a real laser beam would not show up on camera so it was added as an optical effect. The table was precut up the middle and coated with gold paint, while the melting effect was achieved by a man below the table with an oxyacetylene torch. Goldfinger's laser makes a whirring electronic sound, while a real laser would have produced a fairly heat-free and silent cut. In addition to movies and popular culture, laser misconceptions are present in some popular science publications or simple introductory explanations. For example, laser light is not perfectly parallel as is sometimes claimed; all laser beams spread out to some degree as they propagate due to diffraction. In addition, no laser is perfectly monochromatic (i.e., coherent); most operate at several closely spaced frequencies (colors) and even those that nominally operate a single frequency still exhibit some variation in frequency. Furthermore, mode locked lasers are designed to operate with thousands or millions of frequencies locked together to form a short pulse. ↑ (Italian) Il rischio da laser: cosa è e come affrontarlo; analisi di un problema non così lontano da noi PROGRAMMA CORSO DI FORMAZIONE OBBLIGATORIO ANNO 2004, Dimitri Batani (Powerpoint presentation). Retrieved December 20 2007. ↑ The Nobel Prize in Physics 1966 Presentation Speech by Professor Ivar Waller. Retrieved December 20, 2007. ↑ The Nobel Prize in Physics 1964 Retrieved December 20, 2007. ↑ T.H. Miman, (1960) "Stimulated Optical Radiation in Ruby." Nature 187 (736): 493-494. ↑ Sony Corp. "250 mW semiconductor laser diodes that contribute to faster data write operations in CD-R/RW and 100 mW semiconductor laser diodes for DVD+R/RW and DVD-R/RW." Application note. Retrieved December 20, 2007. 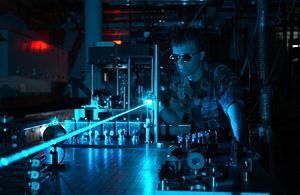 ↑ James Tyrell, Diode lasers get fundamental push to higher power optics.org. Retrieved December 20, 2007. ↑ Arnie Heller, "Orchestrating the world's most powerful laser." Science and Technology Review Lawrence Livermore National Laboratory, (July/August 2005). Retrieved December 20, 2007. 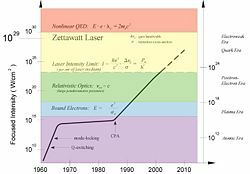 ↑ Schawlow and Townes invent the laser Lucent Technologies Retrieved December 20, 2007. ↑ Photon Systems, Covina, Calif. "Deep UV Lasers". Datasheet. Retrieved December 20, 2007. ↑ "lase" Dictionary.com Retrieved December 20, 2007. ↑ Production Notes - Goldfinger www.mi6.co.uk Retrieved December 20, 2007. Encyclopedia of laser physics and technology by Dr. Rüdiger Paschotta. A Practical Guide to Lasers for Experimenters and Hobbyists by Samuel M. Goldwasser. Homebuilt Lasers Page by Professor Mark Csele. This page was last modified on 21 June 2018, at 20:59.